Not as fancy as it sounds. 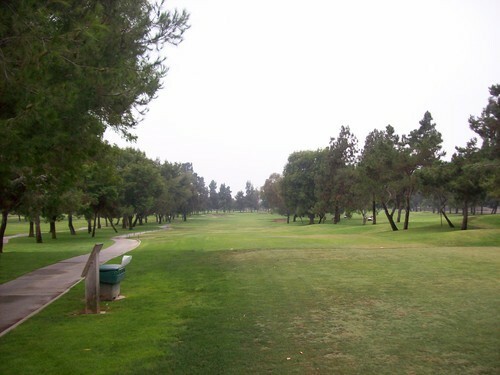 With the PGA Championship on this weekend, I wanted to get out for an early round today and I didn’t want to have to drive too far from home. 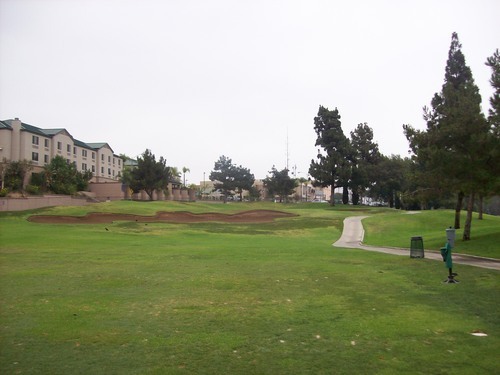 There’s a handful of LA County courses left on my list, so I figured today would be a good chance to check another one out with a walk-on visit. I chose Montebello. I arrived there dark and early, and there was already plenty of action in the parking lot. I couldn’t tell at first if it was just normal Saturday morning traffic or if there was a tournament about to go off. I had checked their online events calendar yesterday and nothing was listed. I made the mistake of not calling ahead like I normally would, but I ended up lucking out. It turns out there was a men’s club tournament going off first thing in the morning, but one of the guys saw I was a stray and asked if I wanted to join his group. I ended up as the fifth in their fivesome and we went off at first light. 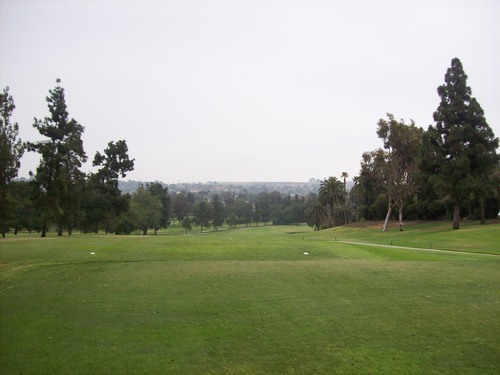 We teed off a little before 6:00 and were done before 10:00, so it was an excellent dawn patrol pace and I had a lot of fun with them as they are all regulars/members of Montebello. I was planning to walk this morning for a little extra exercise and to save a few bucks, but since I joined the pace-setting group they more or less made me get a cart. The price ended up being $55, which is too much for this course if you ask me. 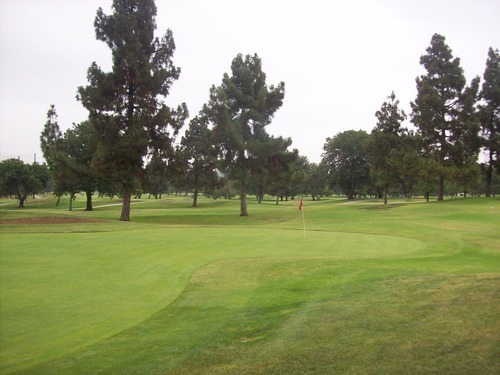 However, it’s standard fare for local city- and county-owned courses on weekends. It is what it is. Since most of these courses aren’t on any of the online discount tee time sites, I’ll be dealing with this a lot (walking on and paying regular rates) as I make my way through the remainder of my list. 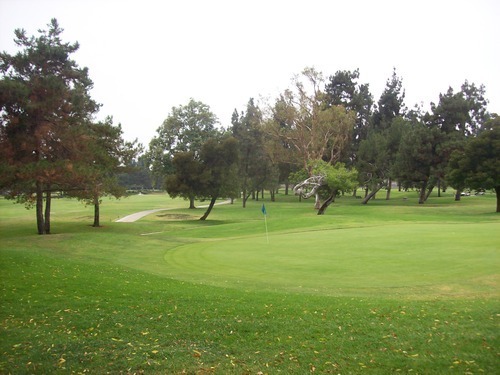 Montebello won’t blow you away, but it’s another solid muni course that fits right in with many others throughout the greater Los Angeles area. 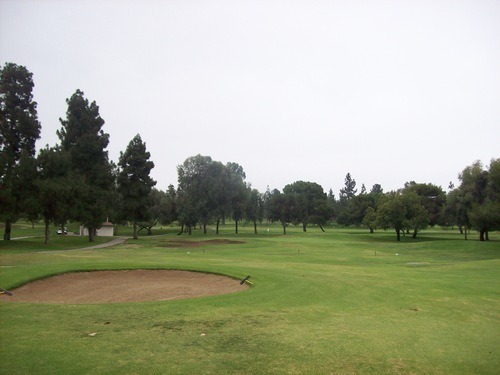 It’s a pretty traditional/classic LA kind of design with tree-lined fairways, minor doglegs, a handful of water hazards and a what-you-see-is-what-you-get kind of layout. 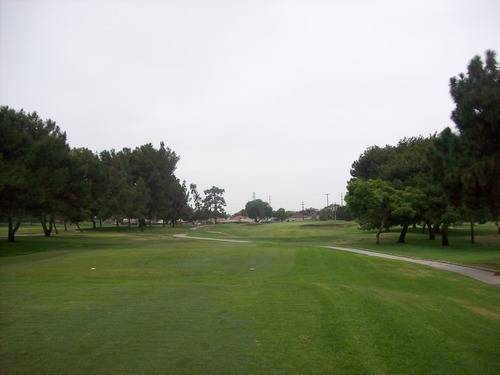 I thought the back nine was a bit more interesting than the front, with the three holes that stood out to me most on that side. 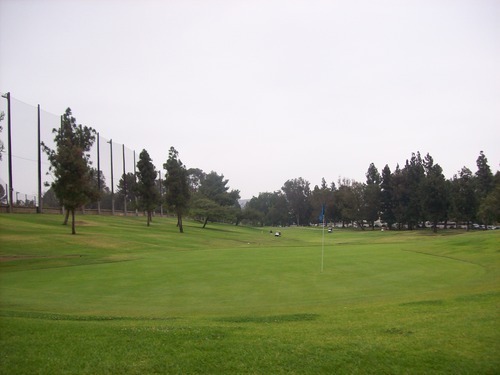 The 10th is a nice par-4 with a downhill tee shot. 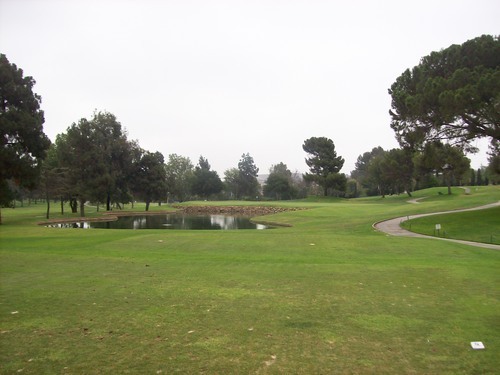 The hole doglegs to the right and then your second shot brings a water hazard into play short and right. 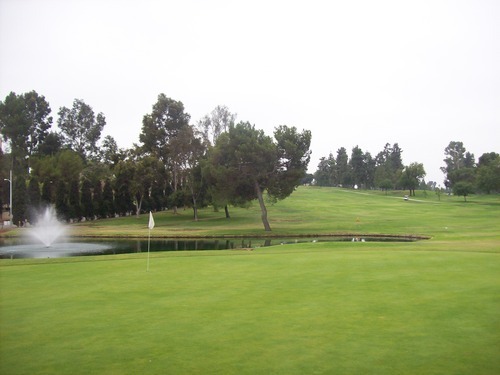 The 12th is a pretty straightforward par-4, with a small pond short and left of the green. I think I just liked the big MCC cut out of hedges next to the green for a “signature” hole presentation that has an old school quality like almost everything here. The 16th is a fantastic par-3 playing over water with a nice-looking rock wall in front for another great aesthetic presentation you might not expect at a course like this. 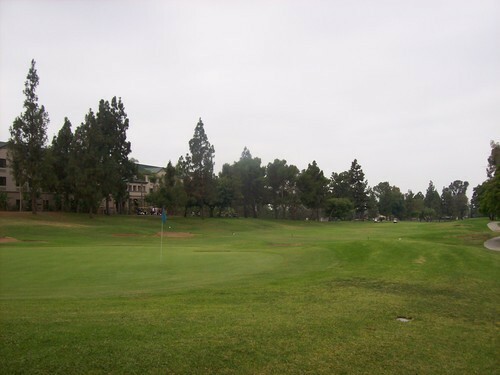 Montebello was in average “muni” shape with things being a little extra damp early on an overcast morning. 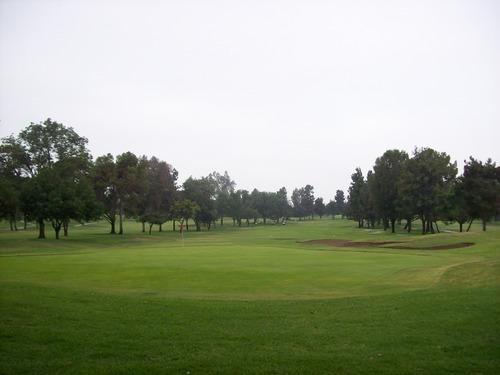 The kikuyu fairways and rough were pretty patchy as is typical—generally good around the greens and mixed lies elsewhere. The tee boxes were good and level. 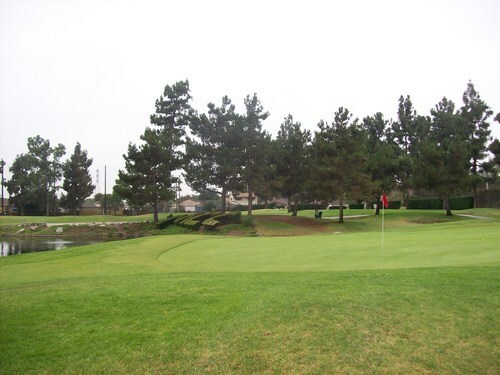 The greens were in nice shape. 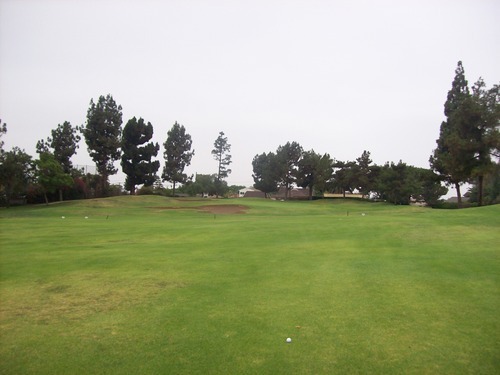 They were very, very soft and a bit slow so early in the morning, but looked and rolled fairly well with a few bumps here and there as expected on a course that gets so much play. 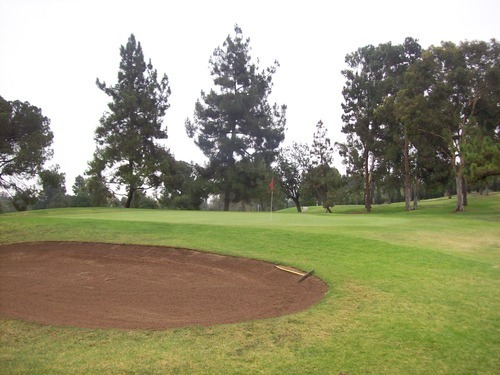 The bunkers were well-stocked with soft sand. I might almost say the top layer was too thick here. It was so wet and heavy it was like hitting through molasses at times. Very difficult to judge. 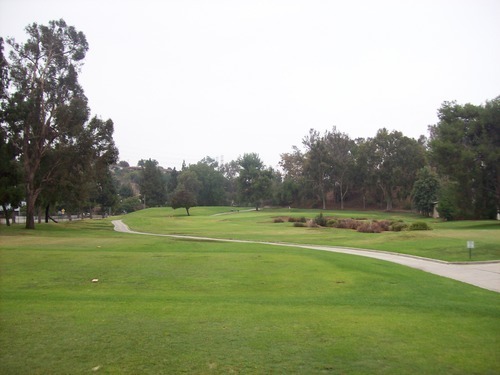 If you can avoid the crowds and enjoy this course at weekday or twilight rates, then it becomes more appealing like so many other local courses. Otherwise, I would consider it just another decent middle-of-the-road option.